Remember those two thrifted XL T-shirts in their original state? One of two thrifted shirts perfectly color-matched to the skirt. 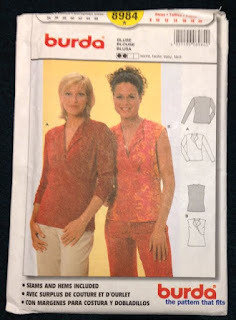 When Burda first started selling paper patterns in the US with seam allowances, a sewing friend raved about this pattern. I bought it. 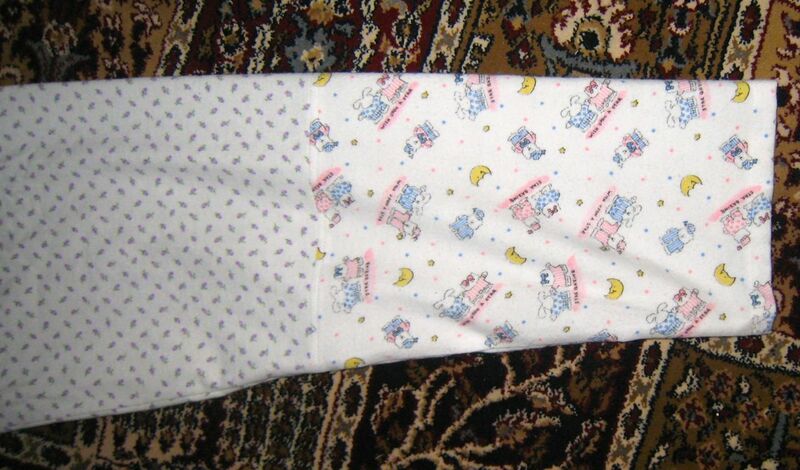 At ~20 years, is this pattern OOP or Vintage? I used scraps of black jersey from another project for facings. One of the sleeves is pieced. All hems were preserved and reused so that I didn't have to break out the twin needle this time. 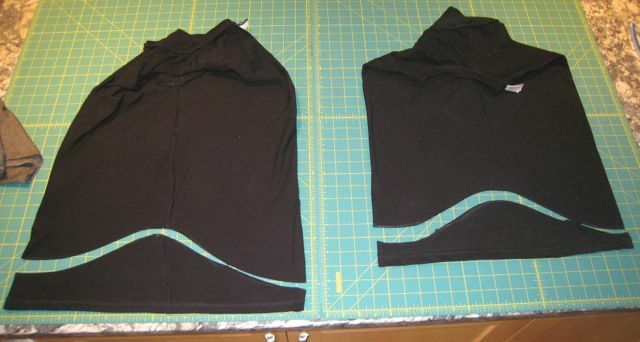 While sewing, I was very impressed with the accuracy of the draft for the shoulders, neck and sleeves. I'll update this post with fit notes after the DD tries it on. Update: The front gapes. If I were making another one from scratch, I would pinch out 1.5 - 2.0" along the slant front opening (in 2-3 places). To alter this top, I will unpick the lower side seams and draw 1.5" in the wrap at the top edge, tapering to nothing at the hem. 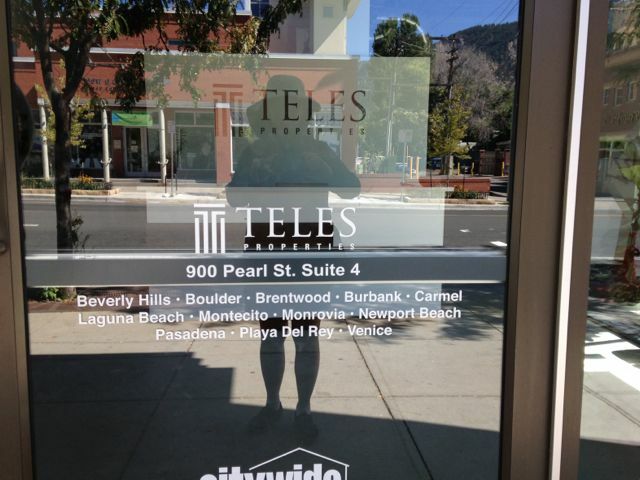 I saw this real estate agency door in my old neighborhood* and realized that Boulder is soooo over. Look at the list of places that are now playgrounds of the extremely rich. 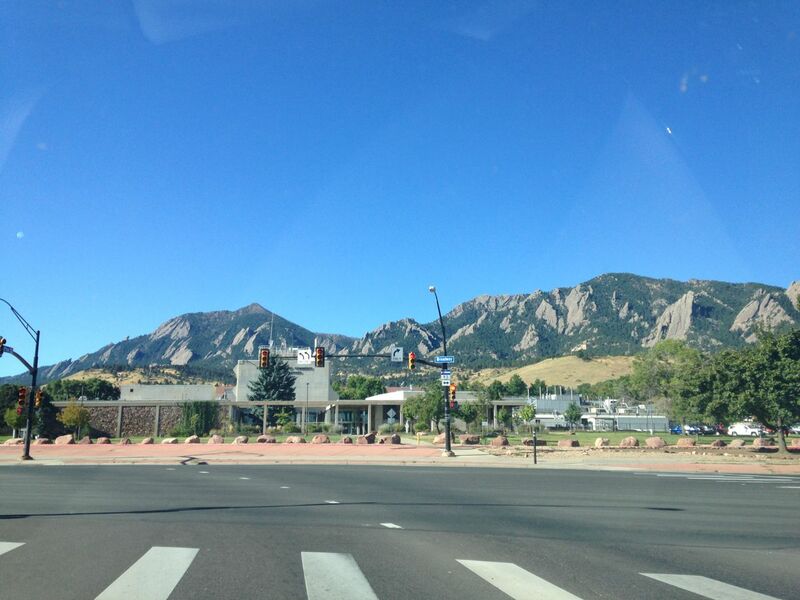 I am especially sad about Boulder and Monrovia because they are towns where scientists who worked at CU/NOAA/NIST/NCAR/JPL/Caltech used to live, but can't afford now. When scientists at national labs can't afford to live close to work, we scatter to the four winds and no longer run into each other outside of work. When something breaks down in lab, it's hard to pop in to fix it on weekends and evenings if you live far away. Alternatively, you could stay in lab more and never see your family. We as a society have decided to pay scientists a lot less than similarly trained professionals and consigned scientists to a financially precarious life. We're not as badly off as artists financially**, but the trend is worrisome. * I lived on West Pearl back when it was inhabited by graduate students and winos. My roommate at the time, a PhD candidate in human geography, said that we were the shock troops of gentrification. She was so, so right. ** Artists do have more freedom to move to cheaper places, but scientists need to work in labs in places like Boulder and Palo Alto. 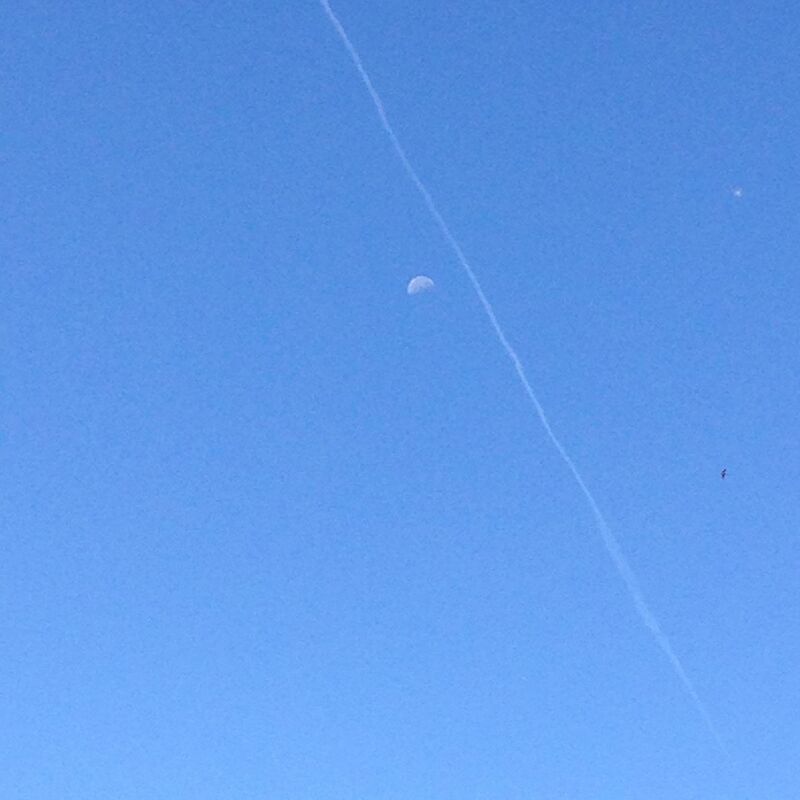 Then there is the two-body problem of finding two science jobs in the same locale when scientists marry one another. This is a severe problem. I read one survey that uncovered that 80% of female PhD physical scientists are married to another physical scientist or an electrical engineer. I spent the weekend at the Jaipur Literature Festival instead of sewing or doing housework. I'm spending my evening hours getting caught up with general housework. 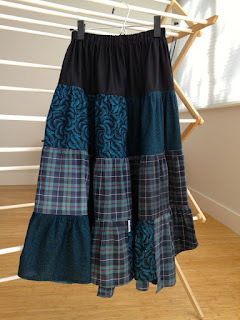 I'll show a refashion from last month. 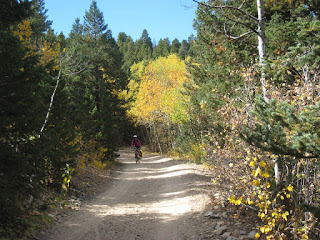 During the mild days of Fall, I often wear t-shirts layered under shirts or light-weight cardigans. I can make my own plain t-shirts, but it's much easier to purchase them from thrift stores ($1 each) and customize the fit. If a t-shirt fits across the chest, it's too snug at the hips. If it fits at the hips, it's too loose at the chest and shoulders. Cut the t-shirt to curve up, above the hips, on the sides. Shorten the front and leave the back long, so it stays tucked in. DD inherited the same build so you see mommy and me black t-shirts trimmed and ready for hemming. 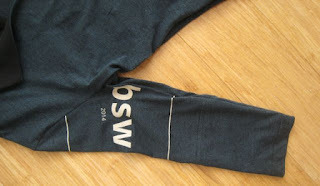 I serge finish the bottoms, turn up, hem with a twin-needle, and give the hem a good press. 30 minutes and we both have basic black layering Ts. As I wrote in Embedded water: cotton, a cotton t-shirt contains 700-1000 gallons of embedded water and ~1 pound of pesticides. Let's get maximum utility out of that water and reduce our global pesticide use. Is it a command performance if she isn't royalty? How about a demand performance? 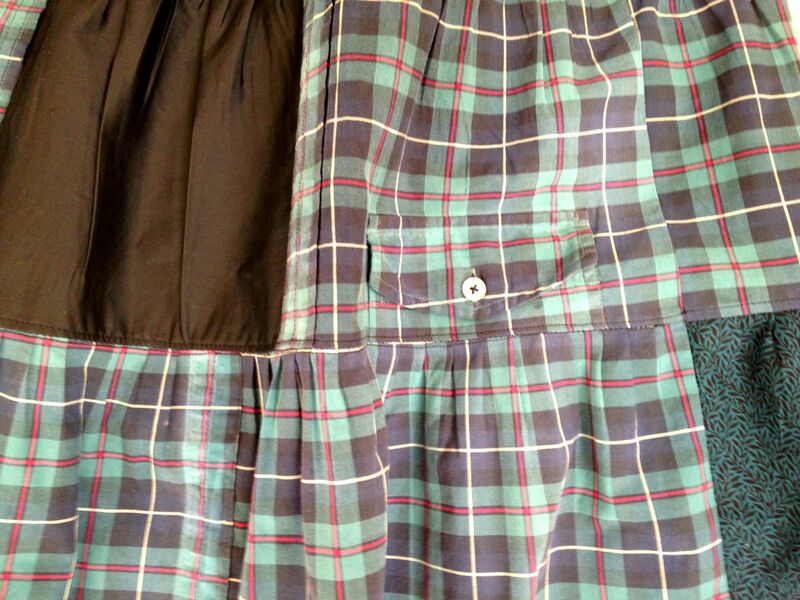 Anyway, I started with Bad Dad's badly frayed black watch plaid shirt. Over the years, it had deteriorated from a lightweight canvas to a poplin-like weight and softness. While I was auditioning fabrics, I came across this 1/4 yard scrap of Jinny Beyer quilting cotton. 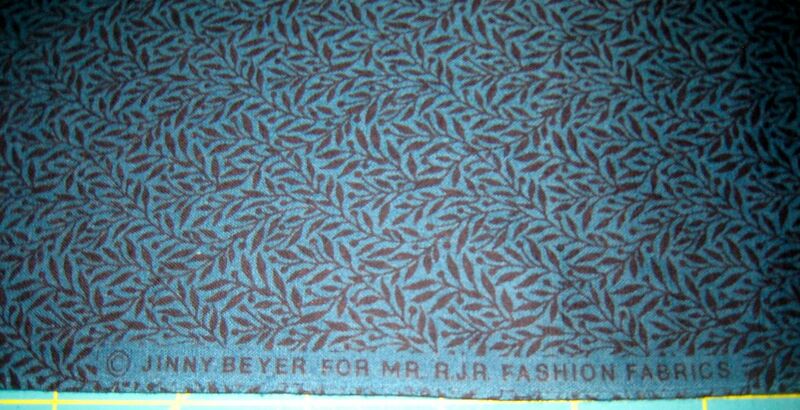 The last time I bought Jinny Beyer fabric, I was in grad school. 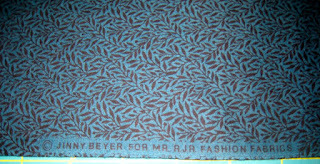 My JB purveyor back then was Elfriede's Fine Fabrics. I bought this fabric nearly 20 years ago for a green + purple tessellated quilt that now lives with my SIL. 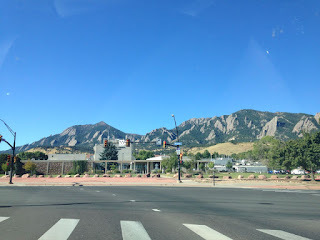 I saved the scrap, moved it to LA, and then moved it back to Boulder--only 1 block from the store where I originally purchased it. 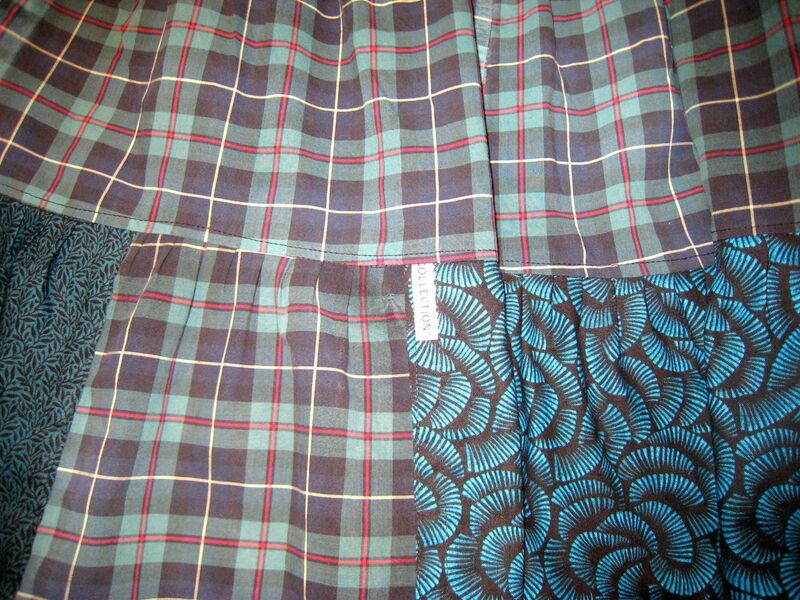 The scrap, in the form of a finished skirt, is going back to LA. Enough about the fabric. 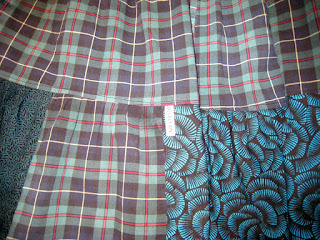 You want to see the finished skirt. Notice that I swapped out the midnight navy pin dots for a solid black poplin. Each side has a flash of white. Another view from a different side. 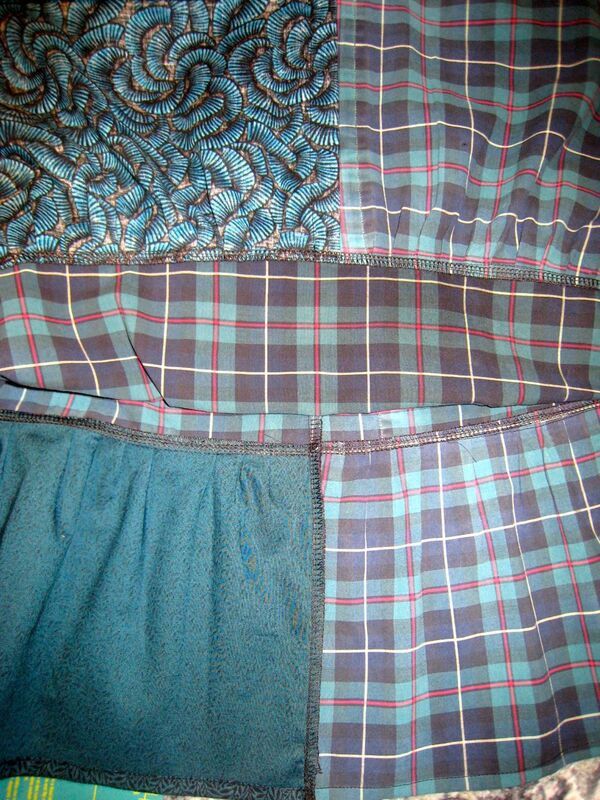 I used a pleating foot, set to pleat every 6th stitch. 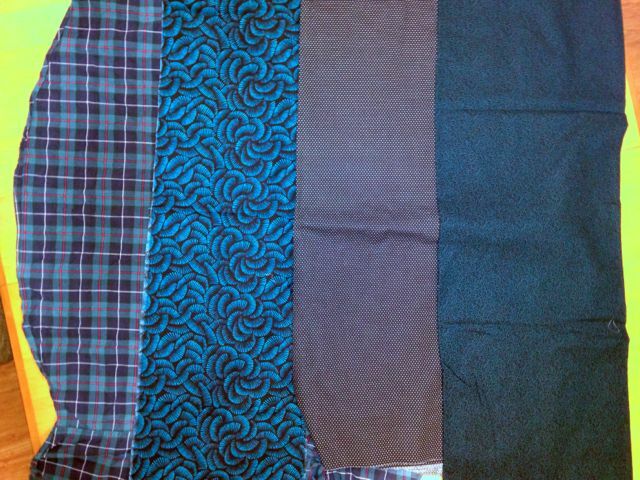 I made a test sample and got a 1.67 ratio of unpleated to pleated length using a scrap of the swirly quilting cotton. That was a bit more than I wanted so I increased the stitch length from 2.7 to 2.8 mm. Mistake. 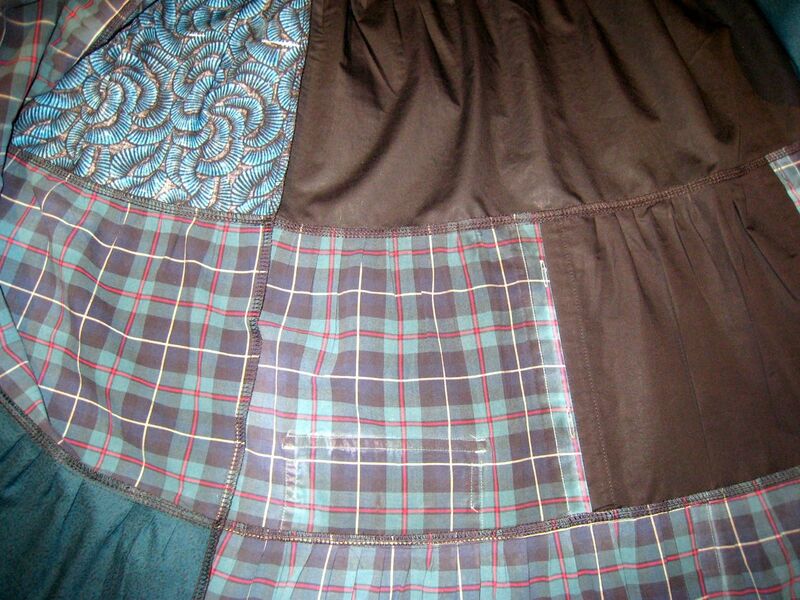 Machine pleaters work best on fabrics with 'grip' such as quilting cotton. They pleat much less effectively on slippery fabric such as the fine cotton poplin at the top. I start with a 9" deep top tier cut at 120-125% of the hip width of the wearer. The other 3 tiers are 8" deep. After making the waist casing, I end up with 4 tiers about 7" deep. 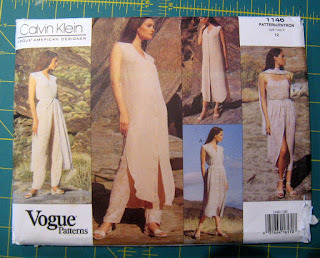 Warning: At a 1.67 ratio, that means a finished hem of ~200". 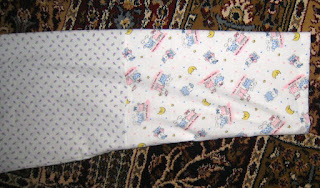 Cut the shirt bottom 9" deep at the center fronts. 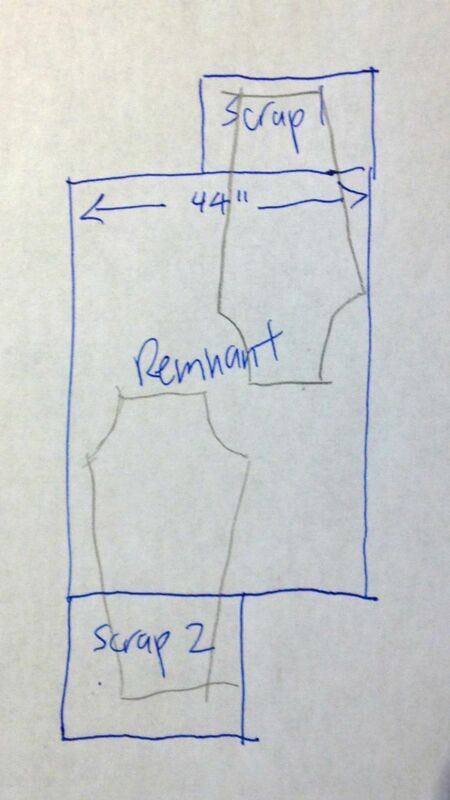 The sides curve up so your overall skirt length will be 29-31". Reuse shirt hems to reduce the amount of hemming you need to do. 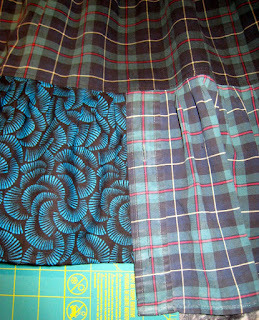 Hem the fabric strips attached to the shirt hems before joining them! 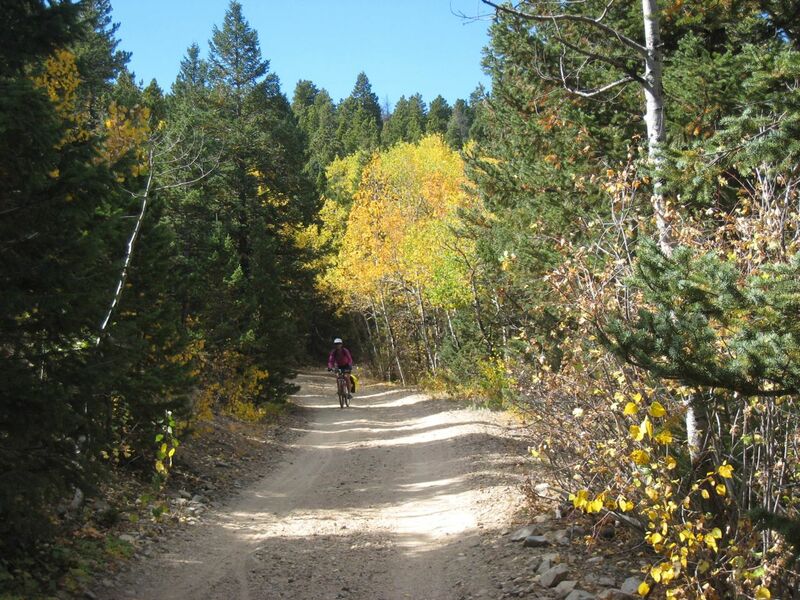 If the selvedges are an even tension, leave them in place. You can use their non-fraying edges and the shirt placket to encase the raw edges of other pieces for a clean finish. Sew the RS of the raw edge to the WS of the clean edge, with the clean edge extending about .5". 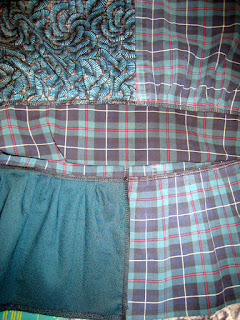 Flip the raw edged piece so the RS is behind the clean edged piece and topstitch from the RS. Pocket flap button resewn after assembly. Cut the buttons off before assembly because they get in the way. After assembly, I sewed the button for the pocket flap back on. I think inclusion of the pocket is a fun detail. When you leave pockets on, make sure they land at the unpleated bottom edge or else it will get too bulky. Set the pleater to 0 when you cross seams and shirt plackets. You don't need to add pleats and bulk at these places. Clean-finished interior with one serged vertical seam. I like the way the selvedge gives a flash of white. I bought two t-shirts at Goodwill that perfectly match the skirt. I plan to make a mock-wrap shirt to complete the outfit. One of two thrifted shirts perfectly color-matched for top. DD says that the wabi-sabi rips and frays are an integral part of the design of these skirts. As they rip, I will layer other fabrics and patch it up as I did here. 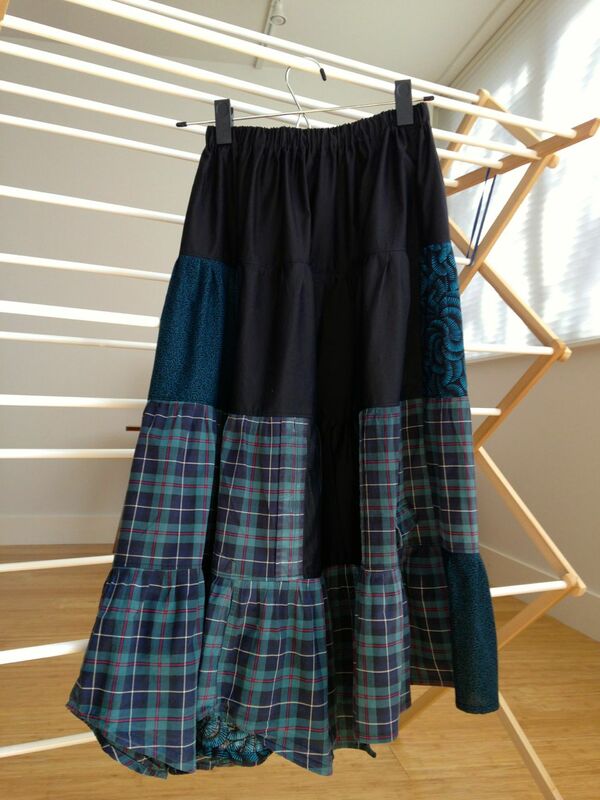 This skirt took 5 hours of work time spread over 6 hours of elapsed time. That's 300 minutes of work for a skirt that is already frayed and will continue to degrade. This isn't clothing construction; this is performance art. I've been following Handmade by Carolyn's One year, one outfit project. She's making an outfit entirely made up of components sourced in her local environment of Western Australia. That is not easy in this day of globalization. Zippers and buttons are made in only a few places in the world now. She's making everything from scratch--right down to carving her own shoe soles from local wood. I am in awe of everything she does. My particular performance art shtick* is to see what I can make from castoffs. Bad dad wore the shirt for years until the visible fraying wasn't fit for public wear. The small sprigged print is leftover from a quilt project. The other two fabrics come from odd-jobbers in LA. The black poplin appears to be a fabric sample used in a wash/shrinkage test and the swirly black/green quilting cotton has small printing flaws. To most people, the components are textile waste. To DD, this is her signature look. 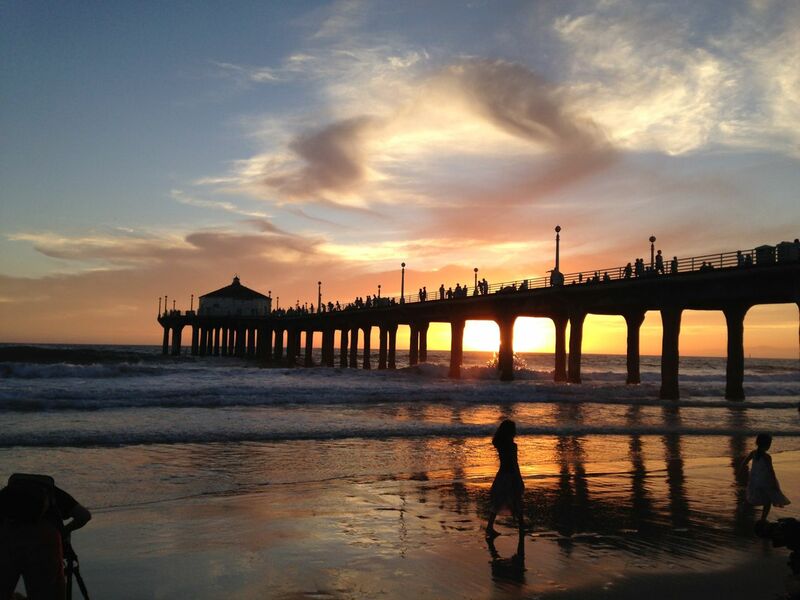 To me, this is how I assuage my enviroguilt for living in two places** and flying back and forth. * Carolyn, I don't mean to call your project shtick. I'm only saying that my work is shtick. ** To be fair, two-PhD families have a very rough time finding jobs in the same place so this living arrangement isn't something we have control over. That doesn't make the enviroguilt completely disappear. 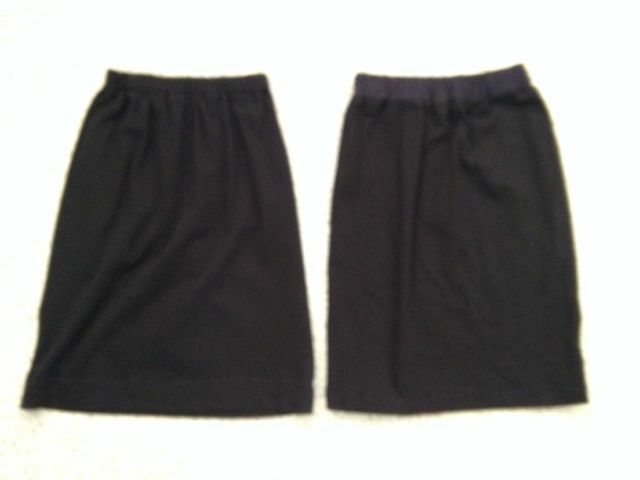 Please excuse this blurry picture of two black skirts. You've seen one ponte pull-on skirt, you've seen them all. Destined to stay in the closet. Vogue 1224 on the left, Simplicity 1072 on the right. When DD asked for more skirts, specifically more tiered ruffled skirts made from recycled shirts, I blanched. Those are extremely time-consuming compared to simple pull-on skirts. 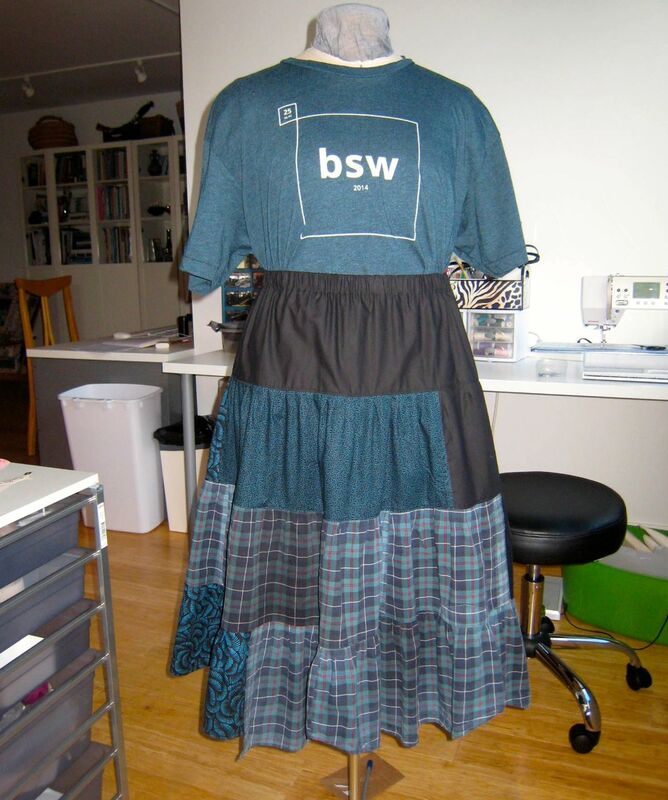 Last year, I made her two tops, two skirts, a pair of shorts and a nightgown. 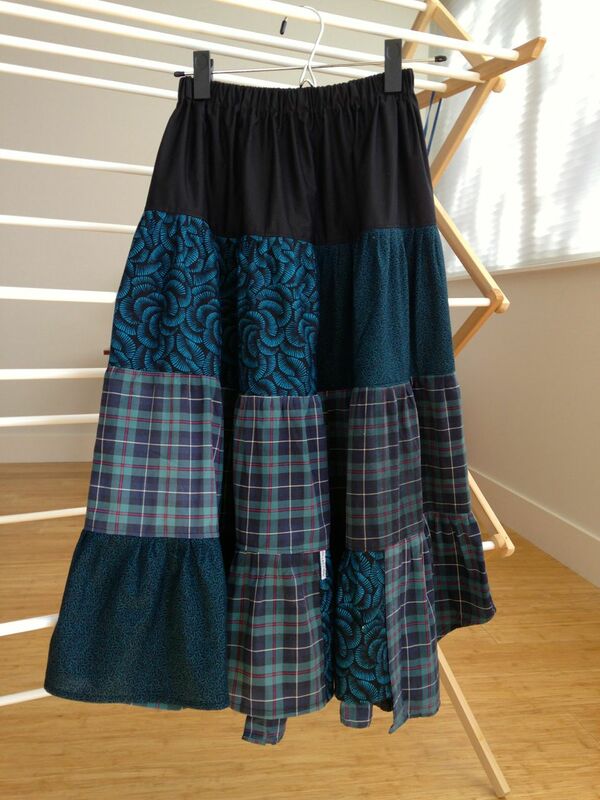 The swirly green skirt gets tons of wear. The black pencil skirt, just once. The scuba knit top got worn none at all. When she asked for more skirts. Emphasis on the plural. I talked her into one time-consuming one and one quick one. 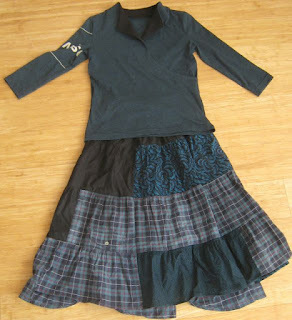 I saw this black ponte and Simplicity 1072 on top of my pile of supplies. The serger was already threaded up in black and the cutting supplies were set up. I whacked this out in 30 minutes. I even improved the fit with back waist darts. Note to self, she doesn't need a black pencil skirt. She already has one and never wears it. She says that they are too confining. Actually, my slim skirts get very little wear for the same reason*. These skirts were quick, but a complete waste of my time. 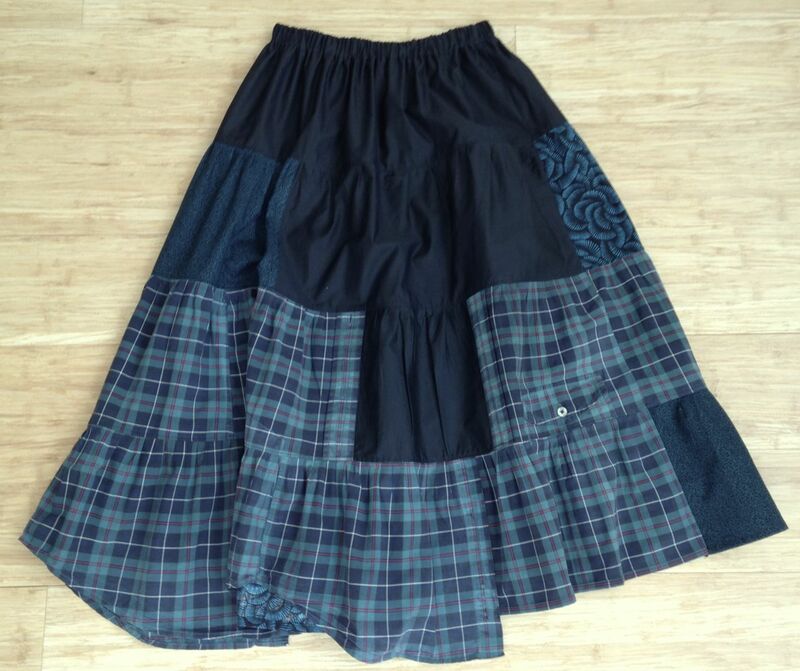 Next, the 300 minute skirt she wanted. I love a good mystery. I think that is what first attracted me to quantum mechanics. The way my professors taught it (and the textbooks were structured), quantum theory unfolds like a great detective story. Pieces of evidence rolled in, players moved about, the truth gradually emerges. The narrative is so strong, you can put together a timeline of the discovery of quantum theory. Has anyone done the same for the weather? If you know of one, can you leave it in the comments? 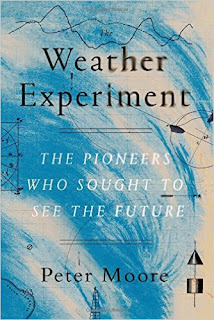 I had hoped that Weather Experiment would be that book, but it isn't. It's not even "The pioneers who sought to see the future" as the subtitle claims. I agree with this review in the NYT; the book is about british men and (mostly) ignores the work in other places. American James Espy and Frenchman Urbain Le Verrier get brief mentions, but this is mostly a bunch of stories/biographies about british men strung together. If you are looking for a coherent narrative of scientific discovery, look very, very carefully. There are nuggets tucked in here and there. When narrating who argued that air masses move up and who argued that they moved in circles and who said that they move horizontally, some context would have been useful. 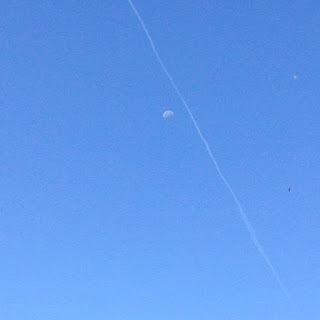 It is possible that they were all right, given their life (weather) experience. The book is fine if you are expecting a bunch of human stories about people who are affiliated with the study of weather as it was practiced in England. There is a useful index. Also, "Stars in FitzRoy's Meteorological Galaxy" just before the index, gives a synopsis of the players, including the ones given short shrift or omitted in this book. I like color. 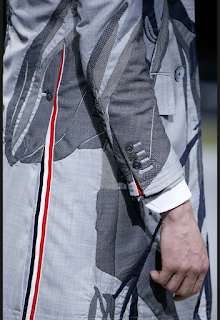 But, Thom Browne is making gray and monochrome exciting. See more detail photos at Vogue.com. Take a look at this video interview in his office. 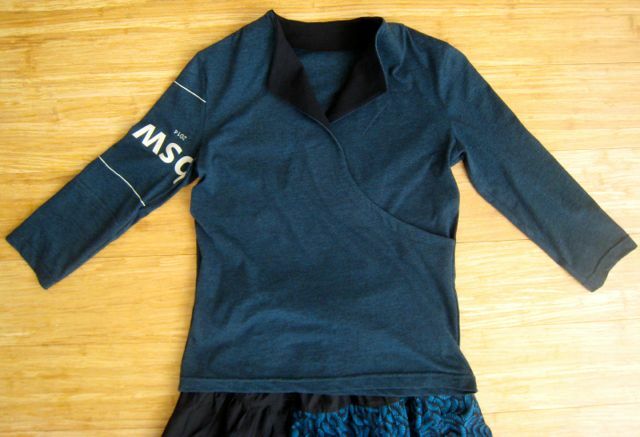 This collection is 90 percent hand-pieced intarsia. That’s a lot of work. It took around three weeks for one seamstress to make one jacket. Not everybody, when they see the finished garment, will understand all the work that goes into it. But the people that do will really understand how special each piece is. In the video, you can see a woman on his staff cut and sew the embellishments. Another cut of the video shows the impeccable welt pocket on a suit jacket. I wish I could afford his clothes because they are so achingly beautiful. I think the tailoring aspect of what I do is very in tune with the way that I live, and my office, and my store, and even my house, because of the uniformity of it, and the rigidity. Especially for women, I love to keep pushing the idea of uniformity, and not so much choice. I think there’s something really refreshing when things don’t change too much. I just finished knitting four subtly different bath mats. I've also been thinking a great deal about design and how to present information. At work, I'm alternating between trying to fix some broken legacy software and writing, filming and editing tutorial videos about how to work with data. That had me going back to the lessons of Edward Tufte. To really highlight differences, you keep all but just one thing the same. Then the change or newness will really pop. That's why scientists do controlled experiments, changing just one thing at a time. 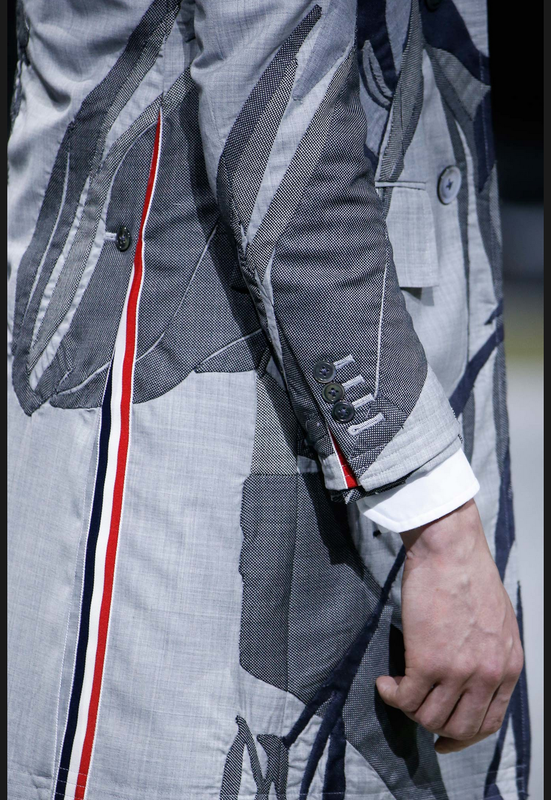 That's why Thom Browne's clothes really speak to me. Anyway, I hope you check out the Edward Tufte books and the clothes of Thom Browne. 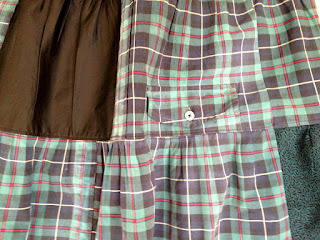 DD has asked for another ruffled skirt made from recycled shirts. She wore hers to rags. It was getting kind of short on her anyway. I took in the elastic of my skirt and she's wearing it now. She loves it so much, she's worried about having a replacement in the wings. This one will be the sixth in the series. I'm off the thrift stores for supplies. Or is that knitting in series? 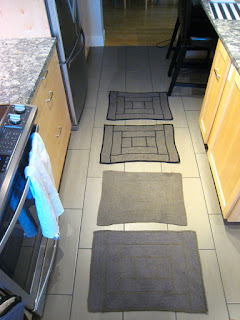 I knit four Absorba bath mats for the new home. In April, I used my tile and counter samples to select colors. 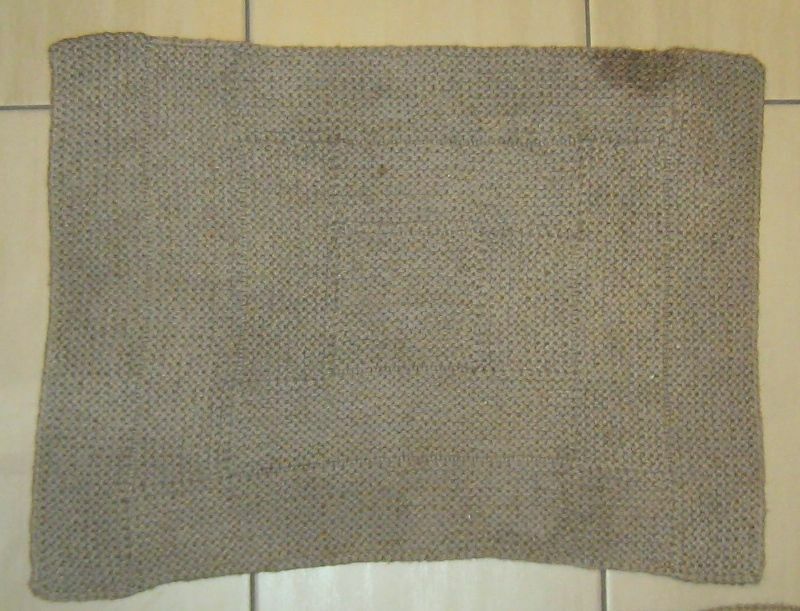 I started out with two strands of worsted weight Bernat cotton for the logs and 10 strands of olive green cotton/rayon/linen lace weight for the outlines. 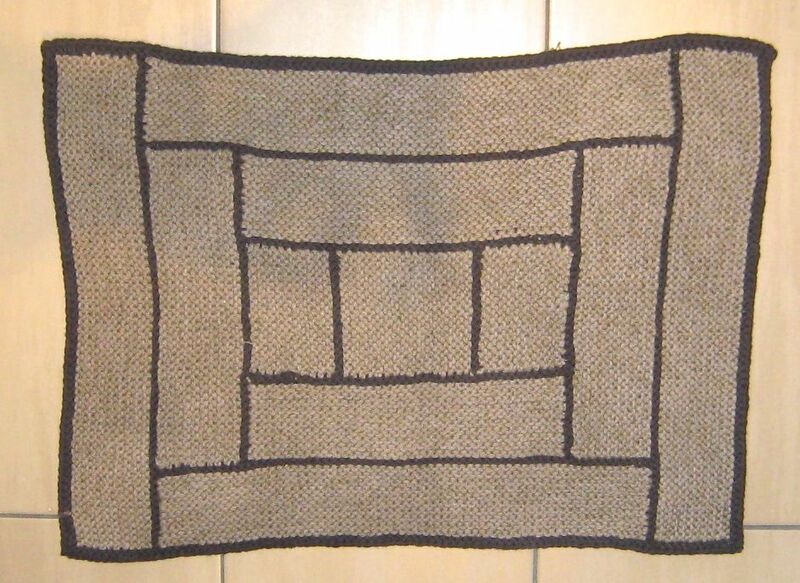 I knit it in symmetrical "courthouse steps" sequence. I would have liked a larger value contrast to make the outlines pop. Putting in the outlines was a lot of extra work (weaving in all those ends) and I want it to show! 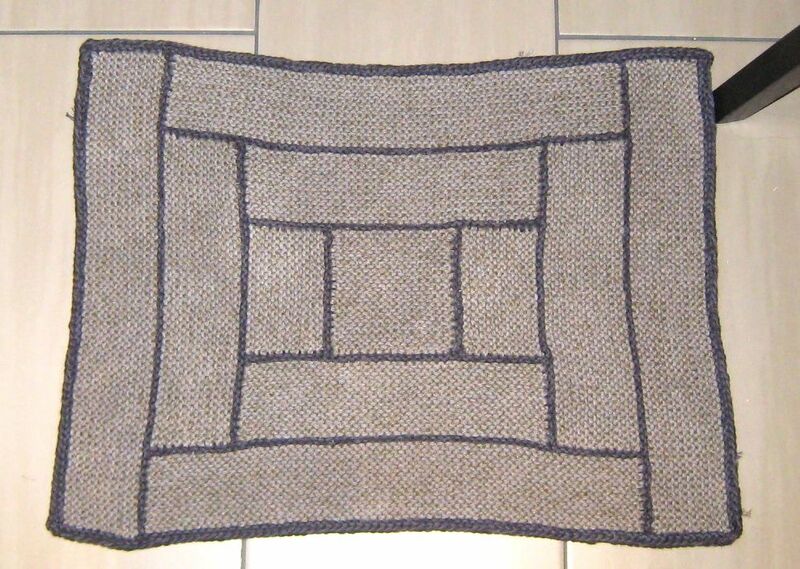 So I knit one with the original log-cabin (asymmetric) pattern, without the borders. In that way, I could use continuous strands of the yarn as I built up the logs in a spiral order. 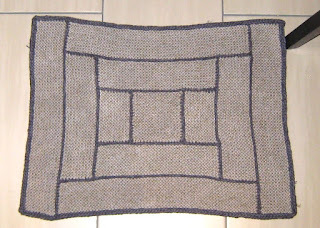 I used one strand of worsted weight gray cotton and four strands of the olive lace weight. It was easier and quicker, but it did not come out perfectly square. 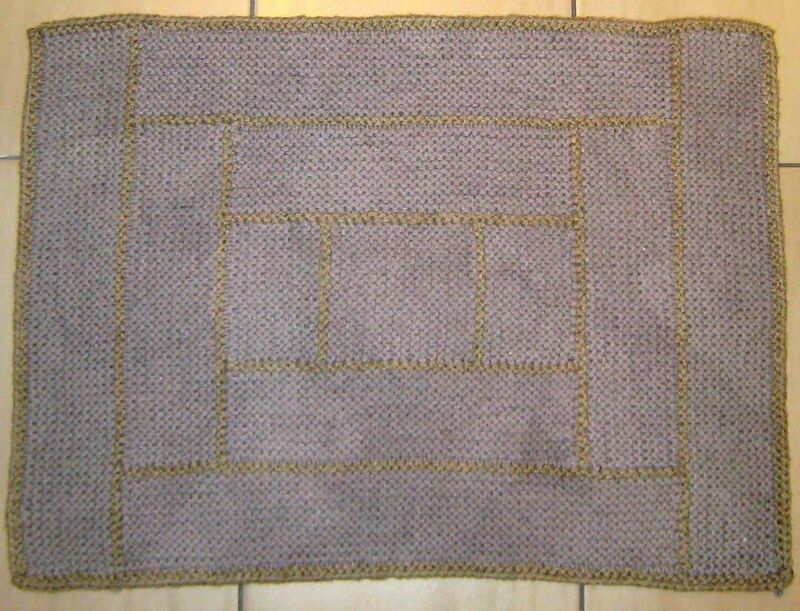 I did like the gray-olive color of the yarn blend. So I went back to courthouse steps-style, using one strand of worsted weight gray cotton and four strands of the olive lace weight for the logs and two strands of black worsted Cotton-ease (cotton/acrylic) for the borders. The black looks a bit harsh next to the gray-olive blend. (Too little to too much value contrast, sigh.) I also did not have enough black to make another. 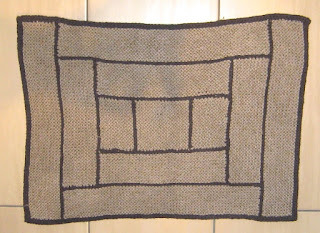 So I used the same olive-gray blend for the logs and one strand each of black and charcoal Cotton-ease. Is this the Goldilocks bathmat? I like them all--even the lopsided one. The gray-olive-black mix goes well with the bathroom and kitchen tiles, which have gray, brown, bronze and olive tones. Knitting 2 kg of cotton is hard on the hands and wrists. It's a good thing that I don't have any more bathrooms to furnish. The blue/white ones I made for my temporary apartment now live in our beach townhouse. See my complete Absorba series.. I am not sure why I purchased this pattern. I'm sure it wasn't to make sleepwear. 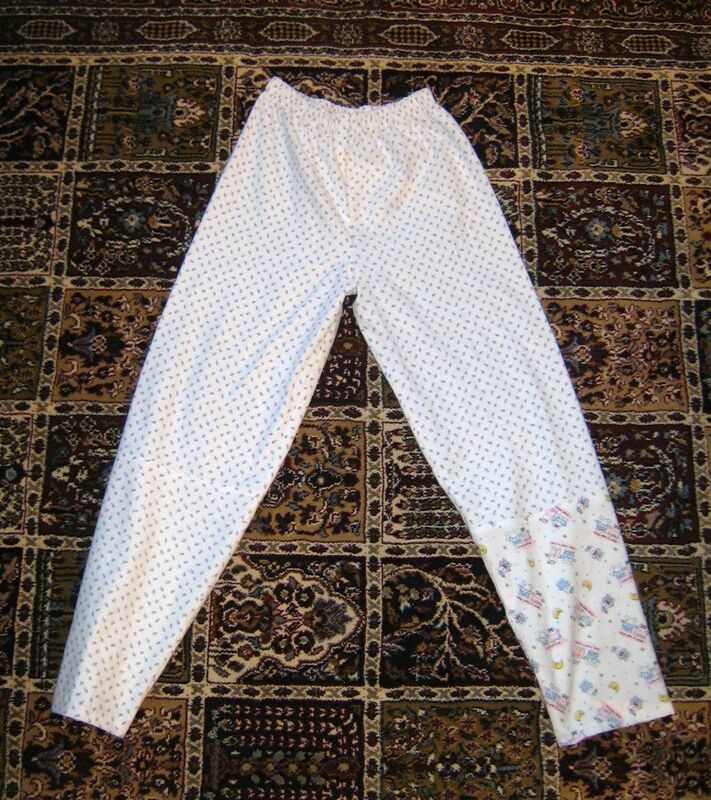 However, the one seam pant has been my go-to PJ pants and shorts for the last 20 years. Last week, I made a pair for DD out of the remnant leftover from another flannel nightgown that was worn to rags. I had one large remnant and one scrap of the little violet flowers. My friend gave me another scrap of flannel with bears. 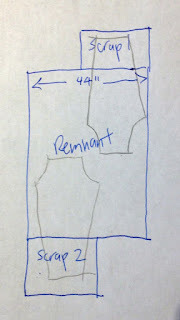 The remnant measured only half the recommended yardage. Some spatial thinking helped me devise a solution. 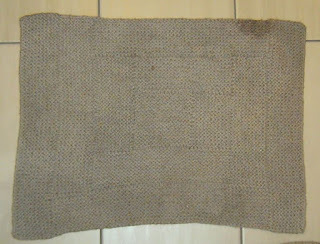 I stitched the scraps to the remnant, then serged, then topstitched the joins to flatten them. The Vogue 1146 PJ tradition extends to another generation.